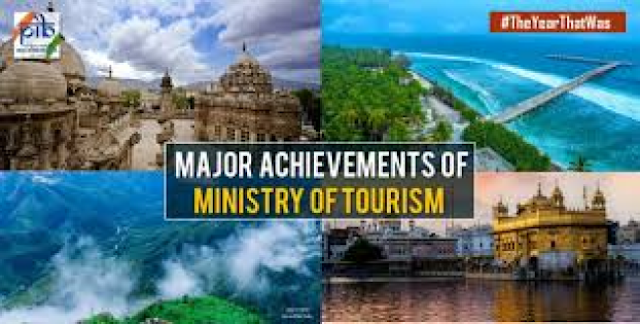 Ministry of Tourism has identified 17 Sites in 12 Clusters for Development as Iconic Tourist Sites. The names of the sites identified for development as Iconic Tourist Sites are - Taj Mahal, Fathepur Sikri. Ajanta, Ellora, Humayun’s Tomb, Qutub Minar, Red Fort, Colva Beach, Amer Fort, Somnath, Dholavira, Khajuraho, Hampi, Mahablipuram, Kaziranga, Kumarakom and Mahabodhi Temple. Master Plans are at the final stages of preparation. Ministry of Tourism organized the International Buddhist Conclave-2018 (IBC-2018) on the theme “Buddha Path—The Living Heritage” in collaboration with the State Governments of Maharashtra, Bihar and Uttar Pradesh. The Hon’ble President of India inaugurated the International Buddhist Conclave-2018 (IBC-2018) at Vigyan Bhawan, New Delhi on 23rd August, 2018 at New Delhi. The event was followed by site visits to Ajanta (Maharashtra), Rajgir, Nalanda & Bodhgaya (Bihar) and Sarnath (Uttar Pradesh). Japan was the ‘Partner Country at IBC-2018. Panel discussion on ‘Role of Living Buddhist Heritage in the Contemporary Society’, B2B meetings between Foreign and Indian Tour Operators, Investors Summit and Presentations by Ministry of Tourism and State Governments were organized as part of the event. During the inaugural session of the Buddhist Conclave, the Ministry of Tourism launched its website www.landofbuddha.in and a new 60 second film showcasing the Buddhist sites in the country.